For today the stats are bearish as it's the last day of the month. 60% closes down at the end of the month since March 2009 and 4 of the last 5 closed down. Tomorrow is the first day of the month and the stats are 65% closes up since March 2009, though it's worth noting that seven of the last ten of these have closed down, and eight of the last twelve, so those first day of the month stats are a good deal weaker than they used to be. In the absence of any surprises today I'd expect early weakness, a low made in the first hour, followed by a grind up for the rest of the day. If ES gets under 1364 that will look encouraging for bears, and there is a possible H&S neckline at 1353 ES where it would be very nice to see a hit. I've been hearing a lot of talk over the last two weeks about how it's bad to call tops or bottoms, and that the SPX may get to the moon before we see a meaningful reversal. That's a view certainly, but there are a couple of points to make about that view. 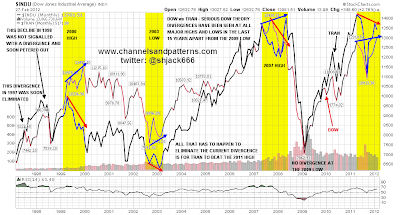 The first is that buying low and selling high is about not blindly buying trends. When you've seen a strong uptrend and you're in overbought territory you should look for some reversal, just as you should after a strong downtrend in oversold territory. 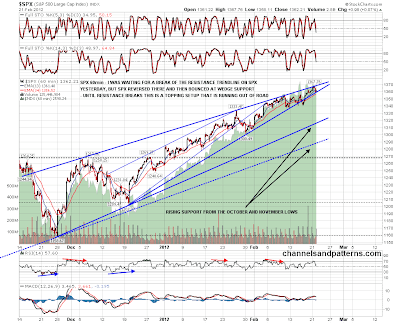 The second is that more than anything else I am a trendline analyst, and I look for short term reversals at trendline support and resistance, and bigger reversals when trendlines break. That doesn't always deliver the goods, but it delivers them a lot of the time, and SPX is currently showing trendline weakness, on negative RSI divergence, at major long term resistance. That is an obvious level to see a reversal of whatever degree. It might not be a major top, but it may well be a minor one. 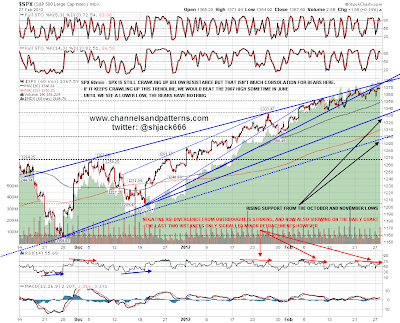 The overall setup on equities today looks weak, though we might well see a bounce to fill the opening gap. Strong trendline resistance is now in the 1375/6 area, and we might yet see a bounce to test that, though I'm leaning against that on balance. 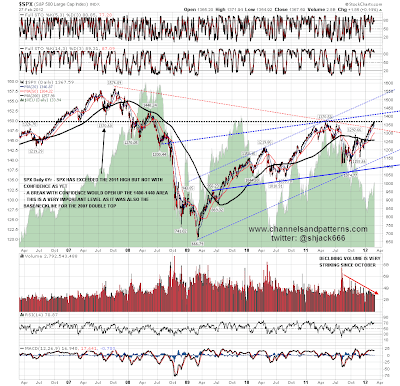 In terms of a bullish break up, there is nothing to see unless that trendline breaks upwards, and though we might see SPX continue to crawl up that resistance trendline, while it holds the trendline bias is short. 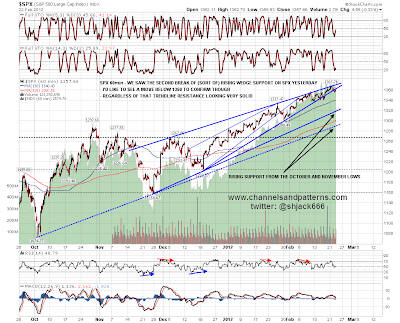 There is a potential short term double-top on SPX which needs a lower low to confirm. 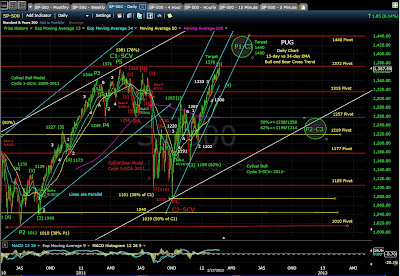 As I said last week, I'm looking more a move below 1350 SPX to confirm a short term high is in. Every so often I chat to parents of my childrens' schoolfriends at parties and so on, and in late 2010 I remarked to one of those parents that I was expecting that rising food prices would destabilise and topple some governments in poorer countries. As the Arab Spring then unfolded during 2011 with governments toppling in Tunisia, Egypt and Libya, and with unrest and unsuccessful (so far) uprisings elsewhere, my reputation as a seer with him was firmly established, so late last year he asked for another prediction for 2012. 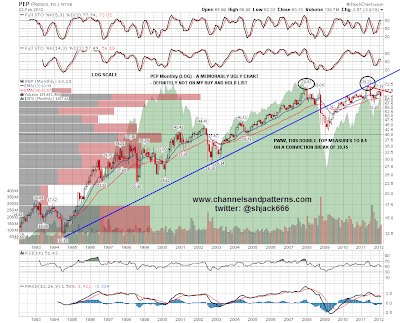 I replied that though it might well not happen, I was seeing a real possibility that oil prices might hit $150 in 2012. That wasn't a chart target and regional instability is obviously one factor behind that prediction. 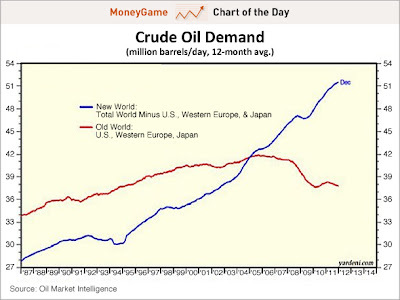 The other is the fast changing basis of crude oil demand, with rapidly increasing demand from the world excluding the US, Europe and Japan, only partly masked by gently falling demand there. Oil demand is growing fast and supply is relatively inelastic, so there is a growing imbalance there that can only be curbed either (temporarily) by economic weakness in emerging markets, or by price rising enough to choke off rising demand and increase supply. Throw in instability in oil producing regions and a possible confrontation with Iran, and you have a potentially very explosive mixture. We'll see. Overall there seems a good chance that the 2011 high on SPX will be tested today, though I'm not expecting a move above 1376 at the most as anything higher would break my very strong resistance trendline. EURUSD is now at my 1.3415 target and we'll see whether that resistance holds. 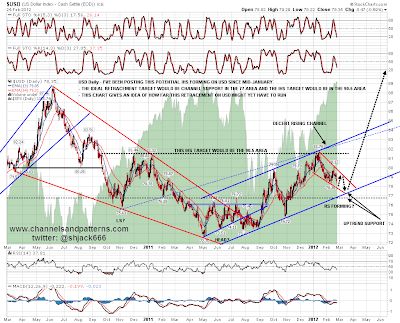 A break above resistance on SPX and/or EURUSD would look bullish and would open up higher targets. We may see early weakness of course as the intraday pattern still strongly favors lows in the first hour followed by a grind up for the rest of the day. I think that the short term top is close or already in. 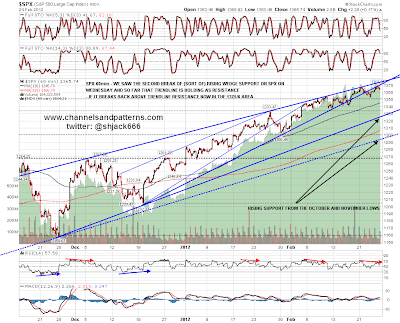 For confirmation that the top is in I would like to see SPX below 1350 and a break down from that rising channel on NQ. I am still seeing some potential for a new high on SPX that would test the 2011 high at 1370.56 and would probably coincide with a test of trendline resistance on EURUSD. If we see that it would be a very nice looking short entry level for both with stops not far above. It really is a funny old world that we live in. The British Pound was hammered overnight when some meeting minutes were released showing that two of the seven members of the British MPC voted for more QE than the others. Why this matters nowadays who knows? The UK is generally seen as a pillar of fiscal rectitude these days as it is taking steps to rein in government spending and to keep public debt at levels where it might credibly be repaid someday. As a result it has taken quite a bit of criticism from the US and much of the EU, where plans for managing government debt at a sustainable level are being disregarded outside the PIIGS. On the other hand the UK is currently running deficits of 10% of GDP, and has now printed money to buy UK debt of $350bn, something over a third of all UK government debt currently outstanding. In effect most of the huge deficits run in the last three years have been financed by printing money. That it is seen as a pillar of fiscal rectitude nonetheless speaks volumes about the profligacy of the countries to which it is being compared. This is the backdrop for the huge bull market in gold that has been running since Gordon Brown, the inept UK Chancellor of the Exchequer, announced in 1999 that he would sell 395 tons of gold, almost 60% of the UK's gold reserves, in order to buy interest-bearing US treasuries. Those sales were made over the next two years and immortalized his name in the famous Brown (double) Bottom of 1999 and 2001. Gold hasn't looked back since and at today's prices that decision has cost the UK over $20bn so far. Gordon Brown went on to become an even more worthless Prime Minister in due course, and has a further enduring legacy in the shape of the vast deficits he bequeathed to the next government. He has now retired to Scotland, and commands large fees on the lecture circuit explaining why his disastrous legacy was unforeseeable and not his fault. Perhaps he runs into Alan Greenspan doing the same every so often. Gordon Brown's argument for selling the gold was that it paid no interest, but nowadays the 0% real return on gold looks very generous, against negative real returns on government debt in the US, UK and others. Central Banks also can't print more gold to debase it, which is a huge advantage against the increasingly debased currencies of the western world, so there is every reason in my view for the bull market in gold to last a lot longer and go a lot higher. 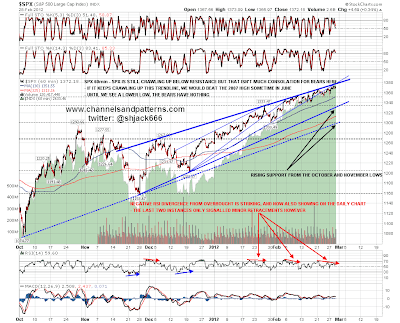 On the equity charts I was watching carefully for a break of rising (sort of wedge) resistance on SPX to see whether the Vix Buy Signal might boost SPX through resistance. 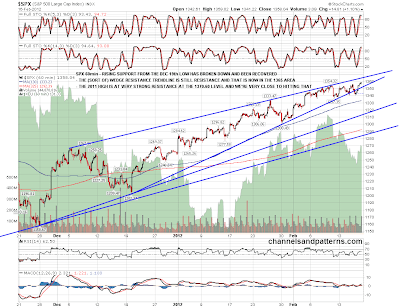 That didn't happen and the high yesterday was exactly at the resistance trendline level I gave yesterday morning. The retracement that followed then bounced at the rising support trendline that started to break down last week, showing that trendline is also still in play. 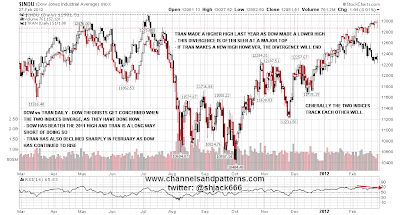 The Transports chart has been the weakest of the major indices over the last few days, and there has already been an almost 5% pullback from the high there, as well as a break with confidence of rising support from the October low. Looking at the chart this morning though I'm seeing a hit of support from the last significant retracement low, and that has formed the left shoulder and head of a possible reversal H&S. A reversal here would also be on significant positive RSI divergence on the 60min chart. 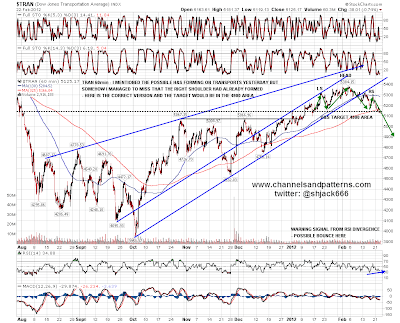 We might well see Transports bounce strongly here to form a right shoulder. I was accused of being wishy-washy yesterday and I cheerfully admit to that again today. 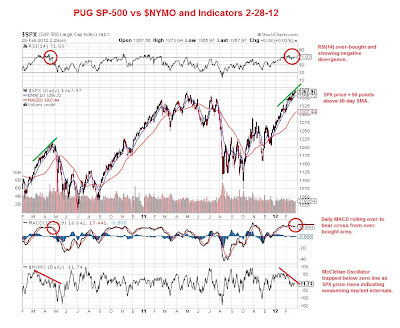 The uptrend is still intact, but so is the strong bearish setup and SPX is now bumping up against both trendline resistance in the high 1360s and strong resistance at the 2011 high in the 1370.60 area. 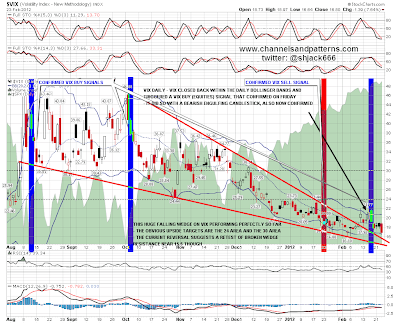 Despite the Vix Buy Signal, the bearish engulfing candlestick on Vix, and the (currently) bullish looking setup on EURUSD, I wouldn't suggest to anyone at this level that going heavily long would be a good idea, and until we see support break again on SPX and break on NQ, shorting this may also have a very unhappy ending. Overall however I'm still leaning short. Until we see SPX and NQ break resistance, the topping setup I was looking at last week is still very much in play, and it is the bulls that have something to prove here. 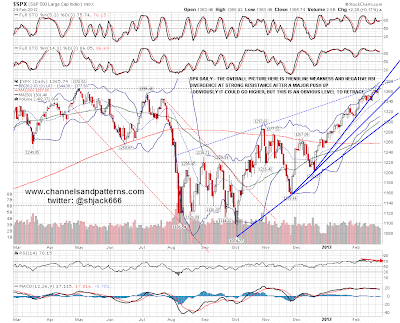 The odds for a gap fill on SPX today look decent, and if we then see a break of rising wedge resistance in the 1367 SPX area I'll be watching strong resistance at the May 2011 high at 1370.58. I've saved the most interesting chart for last. 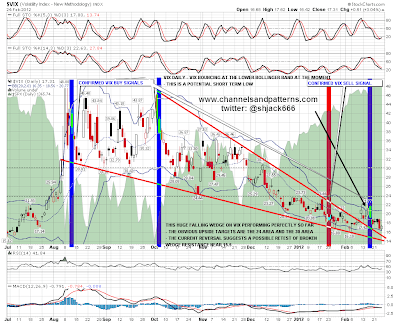 I mentioned yesterday that a close back within the Vix bollinger bands would look bullish for equities and we saw that. 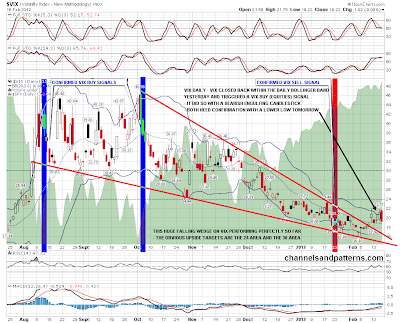 That has triggered a Vix buy (equities) signal and Vix needs to close down again today to confirm that. The more interesting thing however was that the daily candlestick on the Vix yesterday was a bearish engulfing candlestick. 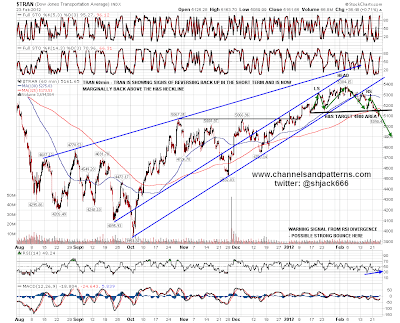 That also needs a lower close today for confirmation. Overall I have mixed feelings here. 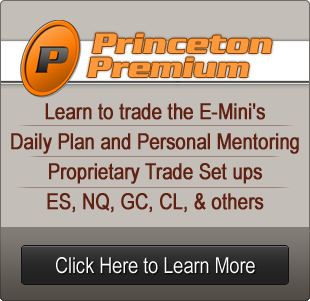 We are still just under strong resistance on both ES and NQ. Copper and EURUSD both made significant lower lows yesterday, and while they've both bounced strongly from those, the overall setup on both still looks bearish. 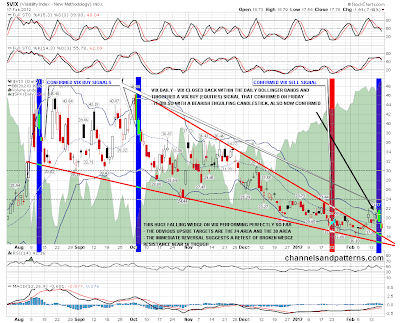 Much depends on the Vix today. If it closes down and confirms the signal and engulfing candlestick, that will be a serious warning that we could see SPX and NQ gap over resistance just above and I'd take that double signal seriously. The stats for today are bearish however, and the day after a trend day also generally sees some retracement or a sideways move. It may well be that Vix closes up and fails to confirm this bearish engulfing candlestick just as the similar candlesticks on SPY and AAPL on Wednesday were negated yesterday. I'm expecting to see some retracement today and am looking for support at the broken and recovered rising support trendline in the 1350 SPX area. If that is broken with confidence then it's worth mentioning that there is currently a double-top setup on ES indicating to the 1310 area on a conviction break of 1334. I'm not expecting to see that play out though, and my WAG for the next few days is that we see some modest retracement today, followed by a test of the 2011 high on SPX on Tuesday or Wednesday of next week. 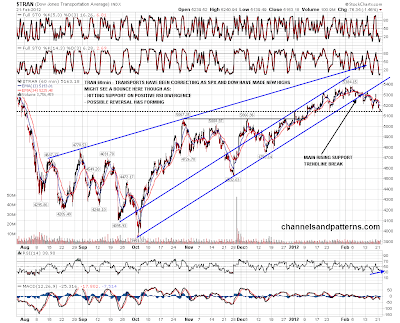 Most likely we should see a more significant retracement from that area. If we see SPX gap up over that resistance and run, then a string of higher upside targets will open up, and the chances of that happening will be much higher if the Vix closes down today.